Let us for a moment imagine a future where schools are run by teachers’ cooperatives. That is, instead of an administrative and financial superstructure of wealthy philanthropists or businesspersons or trusts, political muscle, non-academic leadership and all the trappings of modern world schools, teachers would cooperate to teach, learn and administer the school. The Amul cooperative in India posits a model for cooperatives in the Dairy sector. The then Prime Minister of India, Lal Bahadur Shastri decided that the same approach should become the basis of a National Dairy Development policy. He understood that the success of Amul could be attributed to four important factors. The farmers owned the dairy, their elected representatives managed the village societies and the district union, they employed professionals to operate the dairy and manage its business. Most importantly, the co-operatives were sensitive to the needs of farmers and responsive to their demands. In Education, this is not new (Avalon, SUPAR, Woodland Park). In Can Teachers Run Their Own Schools, Charles Kerchener talks about how such schools lack closed structures, promote open-ness and put greater responsibility on students to manage their own learning. and frequent testing that characterizes some charter schools recognized as successful. …But regardless of the hours put in, students must design projects that meet all the state standards. It is interesting how these cooperatives are organized and how do different stakeholders react to shared leadership and open ecosystems. It is important to note that the exact shape and form for these cooperatives is not something that is designed. Rather it is emergent, based on the dynamics of the people, context and tools. In India, I have yet to come across a similar vision. Doubtless, there exists someone doing it, but it is an idea not yet discussed or explored in policy or other academic circles, at least from what I know. However, there is merit in discussing this model if it leads to increased stakeholder trust & respect, higher quality learning, diversity and autonomy. What if there were a significant proportion of cooperative schools in India catering to local needs, responsive to local community, and creating environments where students could really take responsibility for their own learning? Such cooperatives could be served by other cooperatives as well – for needs ranging from administrative/professional services to even needs such as teacher education and leadership development. Can such a future be? FICCI (the Federation of Indian Chambers of Commerce and Industry) and Ernst and Young took out a report for the FICCI Higher Education Summit 2009. They called it “Making the Indian higher education system future ready”. The report uses trends and understanding of the underlying structures in higher ed in India and proposes alternate educational futures for India. Some overall comments. The report contains references to many useful data sources and collates some major statistics as part of its argument for specific steps to take to derive an alternate future for Indian Higher Ed. The emphasis is majorly on public-private partnership (PPP) and more transparent and minimal governmental control. The focus is also on aligning Vocational Education and Training (VET) with Higher Education. It takes the challenge as one of being that of introducing the freer play of market forces in education, while at the same time playing lip service to problems of equity, rural-urban and gender disparities, social inequities, poor quality of existing education and inadequate access. There are five “game changers” for this report – financing (with focus on telling the government not to fund low quality institutions and to allow fee ‘rationalization’, reduce burdern on governmental financing of higher ed, tax sops for private endowments), ICT (ICT read as virtual classrooms and digital content, read as more purchase orders for IT procurement; national repository for free content), research and innovation (means to incentivise research; i.e. get some more marketable patents, I guess), VET (only teach what industry wants and needs, reduce VET-HE mobility barriers, let private sector in) and Regulatory reforms (consolidate, simplify, reduce entry barriers, become more transparent). According to the report, these five game changers will “solve” three problems – Access, Equity and Quality. Mark that, solve. Lest you get me wrong, I think we need to innovate on all these fronts and the private sector needs to be involved. These are clearly problem areas. But I am looking for solutions that do not accentuate the disparities or perpetuate increasing returns. The disparities are great, even within the outputs of governmental funding. For example, less than 20% of institutions participate in research and the top 10% contributed to 80% of that research (the IITs and IISC are at the very small top of the pyramid). The data offers rich analytical possibilities. Of course there are important gaps, but that is to be expected based on the fact that reports usually start from the desired end result and then reverse engineer the data to fit those aspirations. For example, a glaring loss of focus is on teachers. Interestingly, there is a negatively correlated trend for three countries – USA, India and China. In terms of HE enrolments, China leads (25 mn) followed by USA (17.7 mn) and then India (12.8 mn) in 2007. However the number of HE insitutions shows the perfect reverse – China is last (4000), followed by USA (6700) and then India (21000), in 2007. That is, the number of students per HEI, on average, in China is 6250, in USA it is 2650 and in India it is 581! To add to that, China has the best student-teacher ratio (13.5), followed by the USA (14) followed by India (26). This means that we have a major problem, on average, of capacity planning, too many HEIs and a small teacher base. What if we strategically reduced the HEIs instead and promoted PPP in an effort to modernize and equip the existing HEIs rather than to add completely new ones that would only create artifical competition for qualified teachers and raise barriers for students who cannot pay? Would that work? Does the private sector think that it cannot turn around a state HEI if given the chance to? But this would mean that the private sector has to get into relationships that do not give it direct benefits i.e. does not result in trained manpower for its projects, in patents for its markets, in picking the right input talent (cream) to groom, in supporting urban cities, in contributing to the growth of arts, humanities and sciences (which incidentally forms 65% of the colleges), in not resulting in a market for its products (insurance, education loans, IT equipment) etc. I hope to delve deeper into the report and present it on this blog for comments soon. It is possible that I may understand it better on subsequent reading. Would love to hear your remarks and suggestions. Update: April 3, 2011 – The E&Y Report in detail along with a newer one that they released recently. 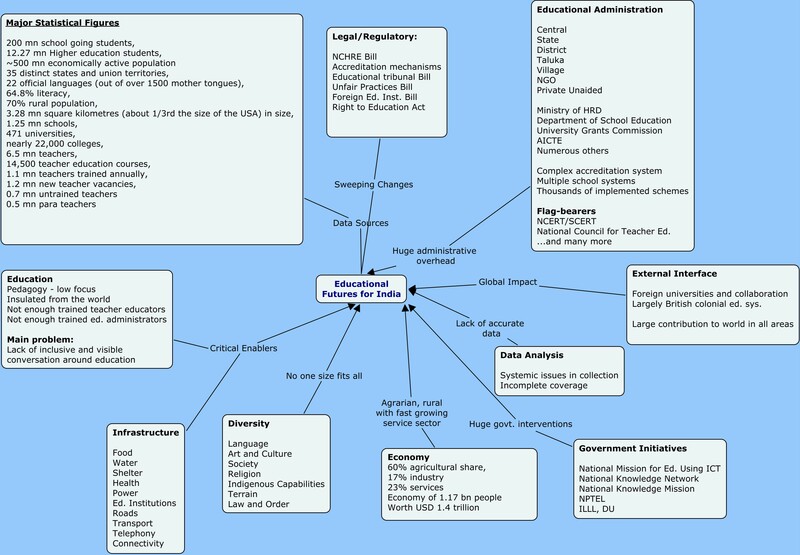 Here is a brief CMap on what I think are some of the major components of a possible Indian educational future. There are trends (and data) to back a whole lot of these elements. Needless to say, this is a first attempt! Please click on the image to get a better view. I have been branding myself as a contrarion over at edFutures in what I see as a fundamental issue, not mere semantics, with how we started the course. All started from the OECD starter framework and the edFutures week 1 discussion that I attempted to initiate on not using trends as our starting point if we are to analytically propose a framework for alternate education futures. Here are some more contrarian views :). George Siemens defines trends as a pattern of change over time. Is a trend a pattern? Lets take for example, the trend towards greater use of social networking tools by the young. Typically, statistical analyses will capture the increasing numbers – of people, networks/groups, shares etc to indicate a trend base on tracking the user. Network analysis and other statistical analyses may reveal patterns in the phenomenon of social networking – whether temporal or not. Starts out as a fad or a keep up with the Joneses and over time emerges as a integral component of our digital life. There is a pattern of use there. Then perhaps there are patterns of network formation and sharing preferences. Some users are aggressive sharers and some are private (the social network encourages and favours aggressive networkers). There may be patterns of induction (one boy in the class gets on FB, everyone follows…isn’t that a cool thing?). You may get a wide distribution between networks/collaborations that are ad-hoc to those that are sustained across many years at a high level of participation and commitment (like a Community of Practice). Different analyses may bring up evidence of complexity, emergence, adaptiveness and chaotic behaviour.These patterns reflect the underlying states of the players – people, locations, technologies, cultures etc. The patterns are empirically observable, maybe even predictable to some degree – like some predictions about how groups form and work gets done (Cogs model etc). So we are essentially talking about different classes or categories of patterns – induction/creation, use, management, destruction, expansion etc. – that describe the phenomena. A trend, however, indicates motion in data constituted by the values of two or more variables. A trend tries to describe relationships between variables. A trend could also try to describe relationships among sets of variables. The trend is not the variables themselves but an indication of how well (or not) they relate to each other. Trends are used to describe these relationships in the context of uncertainty (imperfect correlation) and often raises questions that need to be answered through analytical models. Perfect correlation occurs when there is no uncertainty in the empirically observed relationships. Trends can be temporal or not. Let us think of a phenomenon as a set of states – each state being a definable set of conditions. Patterns could be extracted from the phenomenon based on generalizability (if there is such a word) of a subset of those conditions. E.g. an induction pattern could postulate that the adoption of facebook is an exponential function if it is a local neighbourhood, but a linear function if a teacher in a class of 50 demands everyone sign up as part of the course. One of the facets of a pattern is that it is discernible across a wide range of situations, enough for some analytical or scientific models to be usefully applied to studying it. Various phenomena may be correlated or networked. Sets of phenomena may exhibit complexity or emergence or adaptiveness or chaos or increasing returns. Then let us think about change as change in states of the phenomenon. So patterns that are changing or are in motion would be described by, say, a first order differential of some or all of those subset of conditions that define the state. So we are not looking to describe how the conditions correlate, but rather how the changes in the conditions correlate – e.g. how does the linear function in the example change if there are influential rebels in the classroom who are against social networking. The induction pattern that would emerge is a change over the induction pattern that was originally observed or modeled – maybe a variant or maybe a completely new type of pattern. Patterns can change and evolve. Next, let us look at it from another perspective. Can we discern patterns in changes of state? – yes, we can if there are patterns of change to be found. Perfect correlation: Heat water and at a particular temperature, it will start bubbling; sustain the heat and it will evaporate. Imperfect correlation: (Maybe :)) start CCK08 and ‘n’ variant open courses will follow; complete those successfully and they will spawn ‘N’ other variants of open courses. Those patterns of change may occur over time or over other parameters. Could you find a trend in how these patterns change or the sequence/cycle of patterns? Maybe. But, is the trend the pattern itself? No. A phenomenon is not a trend. A state is not a trend. A pattern is not a trend. A trend is not a pattern. A trend is not a pattern of change. Trends can indicate, describe, inform, influence our thinking of futures, but cannot act as the basis for an analytical model that we are seeking to develop. My work on this blog in the public domain reflects my own personal views and not the views of my employers or endorsed by them in any way. The Vision Paper for MOOCs in Indian Higher Education has been released. Download here! This work by Viplav Baxi is licensed under a Creative Commons Attribution-NonCommercial 4.0 International License.